Horizons was the name of a dark ride attraction at Epcot (then known as EPCOT Center), a theme park at Walt Disney World in Bay Lake, Florida. Located on the eastern side of the "Future World" section of Epcot, the attraction used Disney's Omnimover conveyance system, which took guests past show scenes depicting visions of the future. It is believed to be the sequel to Walt Disney's Carousel of Progress, an attraction in Tomorrowland at Walt Disney World's Magic Kingdom. Horizons was the only attraction in "Future World" to showcase all of Epcot's "Future World" elements: communication, community interaction, energy, transportation, anatomy, physiology, along with man's relationship to the sea, land, air, and space. The attraction officially opened on October 1, 1983, as part of Phase II of Epcot. Horizons originally closed in December 1994, a little more than a year after General Electric had ended its sponsorship of the attraction. Horizons re-opened in December 1995 due to the closure of two other attractions that were down for refurbishment in "Future World", Universe of Energy and World of Motion. The attraction permanently closed on January 9, 1999, after which the attraction was dismantled and its structure demolished to make room for Mission: SPACE, a motion simulator thrill ride that opened on October 9, 2003. The attraction, although extinct, still retains a sizable cult following, especially among Disney park aficionados. Horizons began with a section entitled "Looking Back at Tomorrow," showcasing visions of the future as perceived from the era of Jules Verne through the 1950s. The ride then moved past two immense OMNIMAX screens (groundbreaking technology at the time the ride was built), showing modern technologies and ideas that could be used to build the world of tomorrow. Afterward came the main part of the ride: visions of futuristic life in cities, deserts, undersea, and even in space. The only Disney attraction at the time with multiple endings, Horizons then allowed riders to select which path they wanted to take back to the FuturePort: from the space station Brava Centauri (depicting space colonization), from the desert farm of Mesa Verde (depicting arid-zone agriculture), or from the Sea Castle research base (depicting ocean colonization). As the final part of the ride, guests in their "omnimover" would push a button to select amongst the three choices and would be presented with a 31-second video sequence. A film would then be displayed to riders in each individual car. The videos showed a simulated flyover of an outdoor scene. To create the effect, scale models were built and a camera swept across the futuristic terrain. The models were some of the largest ever created at the time. The model for the desert sequence, for example, was 32 by 75 feet (9.8 by 22.9 m) long. The visual effects were filmed in a hangar at the Burbank airport. Produced in 1983 by 30 model makers, it took over a year to build and shoot the three segments. The exit corridor of the ride originally featured the mural The Prologue and the Promise by renowned space artist Robert T. McCall. Horizons, in its concept phase, was named Century 3 (or Century III), to recognize the third century of American existence (1976–2076). The name was changed to Futureprobe to help appeal the attraction toward international guests who wouldn't understand or appreciate Century 3. In the end, the Futureprobe name was scrapped due to the medical connotation of the word "probe". After much debate, GE and Disney officials settled on the name Horizons. Prior to the start of construction, the project's budget was slashed by $10 million (USD). The building size was reduced and the length of the ride was shrunk by 35%, shortening the ride length by 600 feet (180 m). Horizons opened exactly one year after Epcot opened and was located between World of Motion and the Universe of Energy. The Wonders of Life pavilion became Horizons' new neighbor in 1989, and World of Motion closed in 1996. Horizons remained operational until World of Motion's successor, Test Track, was ready to open to the public in early 1999. It was proposed that Horizons would be the sequel to the Carousel of Progress (located in Tomorrowland at Magic Kingdom), Disney's ride from the General Electric Pavilion at the 1964 New York World's Fair. As the Carousel of Progress followed the changes in lifestyle that faced a family as they lived through the 20th century, Horizons continued their story, showing how they might live in the 21st century. The Carousel's theme song "There's a Great Big Beautiful Tomorrow" was part of the Looking Back at Tomorrow portion of Horizons. The version of "There's a Great Big Beautiful Tomorrow" that could be heard in Horizons coming from a television in the Art Deco scene is the exact version that can still be heard on a radio during the first act of the present Carousel of Progress. The original ride concept came from Reginald Jones (then–CEO of GE) and Jack Welch (future CEO of GE). The concept was to focus on Thomas Edison and his body of work along with the origin of General Electric; it was changed to focus on the future of America, a theme that changed yet again to respect that Epcot was to appeal to a global audience. The building which housed Horizons was designed to resemble a spaceship, while accentuating the third dimension and giving the impression of an infinite horizon. During the early 90s, after GE had dropped sponsorship, some ideas were tossed around about the pavilion being turned into a space-themed pavilion. The building would have been upgraded and rethemed. The ride system would be changed drastically, in which the guest would be in an individual space harness while viewing space stations and space in general and would control the pitch and yaw of the vehicle. On January 9, 1999, Horizons closed permanently. No reason was publicly given, but the lack of corporate sponsorship is widely accepted as having played the largest part in the decision. It is also claimed by some, offering only questionable sources, that a reason for the attraction closing was major structural problems, along with rumored problems with the roof. The building stood unoccupied for well over a year as Disney decided between either relaunching the attraction (which would have required a new storyline and major building renovation and upgrades) or demolishing the building and creating a new attraction in its place. It was decided to build a new cutting-edge outer space-themed attraction, so the Horizons building was slowly torn down in July 2000. The demolition of the building marked the first time in Disney history that an entire ride building had to be demolished in preparation for a new attraction. Construction on Mission: SPACE began in late 2000 and the new attraction opened in 2003. Various props from Horizons have been displayed around Walt Disney World and even in Walt Disney Studios Park at Disneyland Resort Paris. A display that features the butler robot animatronic was set up in EPCOT: Creating the World of Tomorrow for Epcot's 25th anniversary. At Disney's Hollywood Studios, a few of the props from the underwater city scene are displayed in one of the studio warehouses. One of the Desert ships has made its way to Disney's Hollywood Studios, hanging from the ceiling of a restaurant. The McCall mural, The Prologue and the Promise, painted on canvas, was removed prior to demolition and is on display in Disney offices (inaccessible to the public and most cast members). Although there are many rumors as why they demolished Horizons, the leading reason is that the structure was deemed unsafe. The weight and stress of the ride was causing structural issues. There appears to be a sinkhole under a corner of the structure. As such, the sinkhole is filled with metal girders so Mission: SPACE could be built. Some of the attraction's robots appear in the entry mural of Innoventions in Tomorrowland. A number of tributes to Horizons can be found throughout its successor attraction, Mission: SPACE. The center of the gravity wheel in the queue line has the attraction logo, and a stylized version also appears on the front of the checkout counter in the Cargo Bay gift shop at the exit to the attraction. One of the bags in the post-show for the ride (located on guests' left at the start of the exit moving sidewalk) features the words "Mesa Verde" written on it. The undersea post-show scene after the desert scene is reminiscent of a scene in Horizons. This scene is the only post-show scene to be completely new in refurbishing Space Mountain. The flatscreen display in the new scene describes it as "20,000 Light Years under the Sea," a pun on "20,000 Leagues Under the Sea," which is a reference to the defunct Magic Kingdom attraction 20,000 Leagues Under the Sea: Submarine Voyage. The robot butler and futuristic city skyline, which is the last post-show diorama, are similar to a scene in Horizons. Some of the props used in Horizons are on display in the exhibition gallery before the film, including the famous robot butler. Located at the exit of the Star Tours at Tokyo Disneyland is a kiosk featuring video of 3 other Star Tours excursions. Each different "Tour" advertised is the full 31 second sequence from the Horizons finale. The Mesa Verde, Brava Centauri Space Colony, and Sea Castle ending sequences are unedited and played in their entirety. October 1, 1983, Horizons opens as part of EPCOT Center's 1st Anniversary celebration. September 30, 1993, General Electric's sponsorship ends after expiration of 10-year contract. December 1994, Horizons closes indefinitely. Disney officials give no timetable for reopening. December 1995, Horizons re-opens while Universe of Energy and World of Motion are being refurbished, (both these attractions remained open until January 21 and 2, 1996 respectively). December 31, 1998, Disney internal staff newsletter (Eyes and Ears) announces that Horizons will close for good. 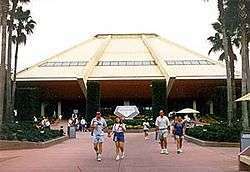 January 9, 1999, Horizons closes permanently. September 23, 1999, All Horizons signs are removed. September 30, 1999, Horizons briefly reopens, but only for press groups. July 7, 2000, Horizons pavilion building is in the process of demolition. September 10, 2000, Construction begins for Mission: SPACE on the former site of Horizons. August 15, 2003, Mission: SPACE opens to the public. September 19, 2003, Walt Disney World issues a Horizons pin commemorating the attraction. Shown on the pin is Mickey Mouse, the ride's building, and the years 1983 and 1999 to signify the years between which the ride operated. September 9, 2005, Walt Disney World issues a license plate pin, part of their lanyard series, commemorating Horizons. August 17, 2007, Walt Disney World releases another commemorative pin as part of its White Glove Remember When series. July 1, 2008, Walt Disney World releases yet another commemorative pin as part of its White Glove Retro Epcot series. February 11, 2010, Walt Disney World releases a fourth pin dedicated to Horizons and Mission: Space as part of its Then and Now series. ↑ "Horizons at Epcot Center Timeline". 1 2 "Space Mountain Soft Opening: Queue, Ride and Post Show – Full Coverage Including Photos and Videos". JeffLangeDVD.com.